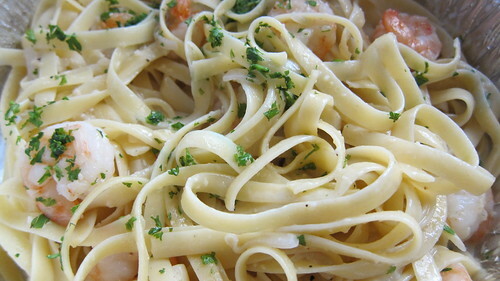 Viztango: Shrimp Scampi from a Food Truck? Now that you can get pretty much any culture's culinary staple tucked in a taco, I decided to think outside the tortilla. Could I find good shrimp scampi on a food truck? As a friend of mine asked: why would you try? Chutzpah, hubris, a calculated attempt to strengthen my GI tract's disease resistance. In short, I was curious. 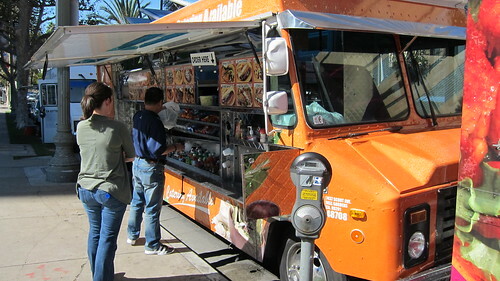 I hit up the apparently Twitter-less Viztango truck, parked during a recent lunch hour along Wilshire Boulevard, where it has plenty of competition: hot dogs, cheesesteaks, ramen, sushi and more. Though the truck is bright orange, it doesn't have much visual appeal, and the name won't resonate -- unless you're current or recent USC student. Then you may know the truck as an offshoot of Viztango Café, which has been serving cheap, decent Italian food to USC students for the better part of a decade. I decided against the popular tequila farfalle -- bowtie pasta with shrimp and onions in a tequila-spiked cream sauce -- in favor of a classic: shrimp scampi. Somewhere between the freshly made ribbons of reginette at Osteria Mamma and tins of Chef Boyardee, there's a vast middle ground of Italian food. It's probably the Italian food a lot of us grew up with. Viztango falls solidly within that tradition. Scampi is a simple dish: shrimp cooked in butter and garlic. 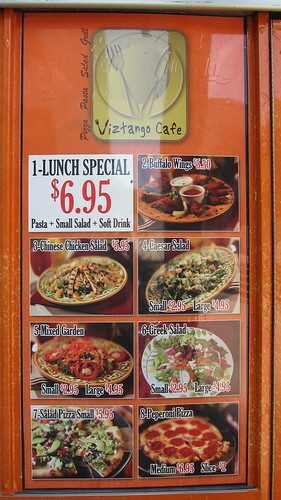 Viztango's version was light and not too greasy, a pleasant surprise. For people who prefer the Olive Garden style of saucing (i.e. sauce blanketing every square centimeter of pasta), this may be a disappointment. For me, this is a bonus. The dish had half-a-dozen small, pink shrimp sans tails -- convenient for lunchtime eaters who are in a hurry. Sure, the shrimp weren't fresh or particularly flavorful, but they weren't rubbery either. And for the money -- $6.95 for enough pasta to put me in a carb coma if I'd finished it -- it's a very good value. My expectations of shrimp scampi from a food truck weren't high, so it wasn't difficult for Viztango to meet them. Still, I've worked along that corridor of Miracle Mile. I know how limited the lunchtime options are in that neighborhood. Viztango's shrimp scampi was as good as or better than any pasta I've ever had from the Marie Callendar's, which would have charged me twice as much and taken three times as long.